iPhone users, we are back again! Just as we promised, we have delivered! 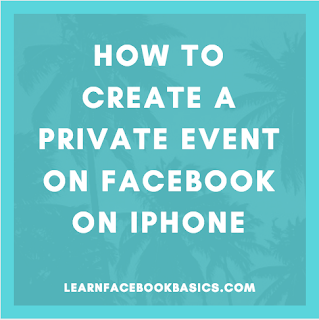 Check out how to create a private event on your iPhone both on your Facebook application and browser. If you are using an Android phone, don't worry, we've still got your back. Check out this article: How do you create a private event on Facebook? On the top right-hand corner of the page, tap on "Create"
Under "Create Event", you will see that its already set to "Private"
When you are done, tap on "Create" at the top right hand corner of the page.